In 1976, artist and critic Brian O’Doherty set the art world abuzz with a three-part essay published in Artforum. Titled “Inside the White Cube,” the essay gave a catchy, new name to a mode of display that had long ago achieved dominance in museums and commercial galleries. He confronted the modernist obsession with the white cube, arguing that every object became almost sacred inside it, making the reading of art problematic. The term carries further connotations of exclusivity, as well as an institution of set rules and aesthetics. Cages are intuitively synonymous with animals and limiting their environment and view with restricting bars. Gates and fences are familiar in urban environments around the world. From chain link fences surrounding playgrounds, to bars that cover windows, and also fixtures used by people to sell goods. In recent times, visual makers have been conscious of this visual language in the urban environment and have used it extensively to convey a relationship with exclusivity. In Late 2013, Jonas Wood exhibited at The Lever House. 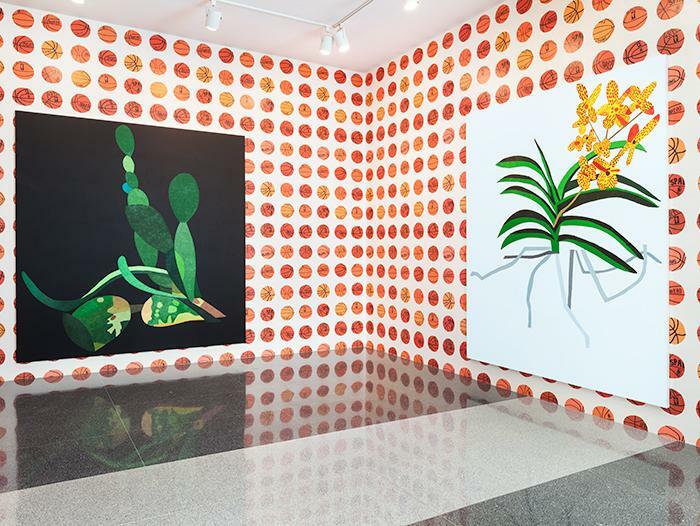 His approach to the exhibition was creating a wallpaper of various basketballs that covered the space’s walls and hanging large-scale paintings of singular plants. Even though the game of basketball is enjoyed throughout the world as a form of entertainment of all social classes, it is inherently a symbol of hope for those that grew up in an urban environment. 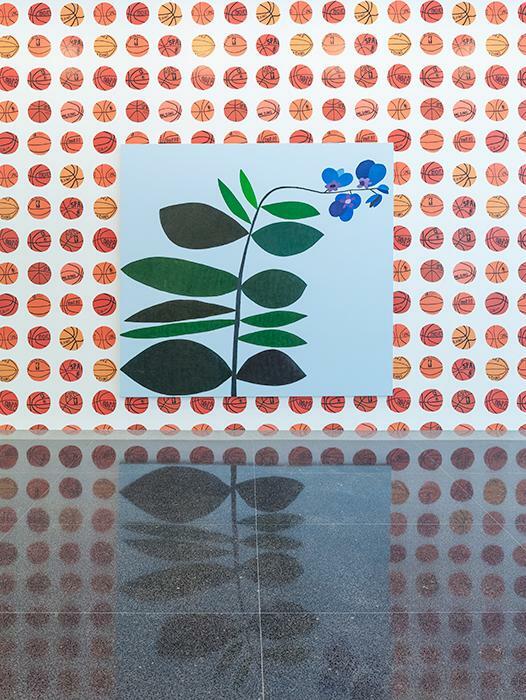 One can compare the use of Jonas Wood’s wallpaper to Reginald Sylvester’s use of chain link fences. The Lever House art collection is a prestigious collection amongst a prestigious culture. With a collection and history of contemporary giants such as Keith Haring, Damien Hirst, and Urs Fischer, Reginald Sylvester II’s Premonition indirectly confronts the history of this collection. The beautiful marble walls and planters throughout the space can be expected for a building such as The Lever House, in its location in Manhattan. 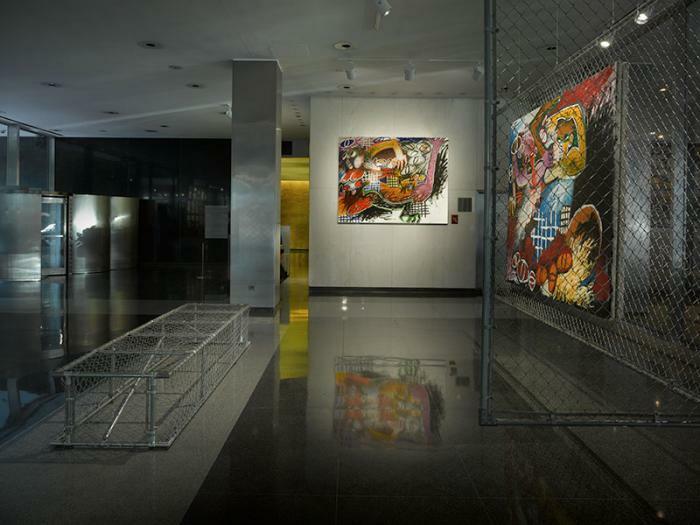 The gesture of using chain link fences not only adds an environmental dialogue to the paintings, but, also, the viewer pays attention to the use of the marble in dialogue with the paintings. Chain link fences are used as physical and vision barriers in urban environments. However, in Premonition, it is used not only as a hanging device, but valued on the same plane as a luxurious material as marble. This second-hand/vintage store embodies a clear identity and vision of its merchandise. Focusing primarily on brands and ephemera of the “Hip-Hop Era” (mid 80’s- early 2000’s), as well as the brands that are influenced by that era. The most distinct design decision of its stores is the use of the chain link fence, upon which they mainly premier notable high-demand pieces. They use the fence as an armature, similar to its use in flea markets and street sales as a display. I believe that Round Two’s use of the chain link fence provides clarity to its consumers—consumers of the history and lineage of the brands that they collect, and shows its respect to the history of street culture. Aleali May’s approach to the environment surrounding the release of her highly anticipated Jordan 1 sneaker pays homage to South Central LA culture through the landmark of the Slauson Swap Meet. For Angelenos that have a relationship with the urban environment, there is a relationship with swap meet culture, but more specifically, the Slauson Swap Meet. Aleali May tapped into the idea that the Slauson Swap Meet was a place to consume all of your visual make-up needs. The use of slotted wall paneling and boxed armature frame is a universal visual language that could be understood in urban environments the world over. More interesting is the highlighted reference material and archived Jordan clothing from the early 90’s (a Jordan sweater that compared the language of the basketball net to a chain link fence). This comes as no surprise to the clarity of Nike brand and its marketing of Michael Jordan’s merchandise to the urban consumer. This recent show at Night Gallery uses techniques of assemblage, and refers to Emory Douglas illustrations (a seemingly appropriate gesture to describe the current temperature in the urban environments throughout America). Erizku uses various materials of “un-preciousness” to further describe this narrative, but one material seemed most prevalent—corrugated metal. The treatment of this material is familiar in the urban landscape for its use in fencing, as well as its use in picket fences. To further distance the “preciousness” connotation of the gallery white cube, Erizku paints all visible walls blue and yellow, and uses this graphic approach to control the viewer’s navigation throughout the space. The literal and figurative elements both embody a sense of protection, and more—pride of the urban, black American identity. Henry Taylor created a unique environment that activated experience and emotion further than the figurative language could do within the paintings. Henry Taylor’s socially loaded portrait paintings constantly critique value in the urban culture and its value in mainstream society. In his 2016 exhibit at Blum & Poe Los Angeles, he created various environments of forgotten slum, to a privileged oasis, to what feels like an intimate artist’s studio. Within the exhibition are two fences. The first is a chain link fence accompanied by a partial cinder block wall covered in graffiti. This shows the chain link fences natural environment, and as a symbol. The second fence one you would expect when entering a large estate, or any place of great exclusivity and prestige. The artist makes the distinction even more clear when viewers walk from a room of dirt into a room of Astroturf. This exhibition is currently showing at Fort Gansevoort and explores the textures and identity of the urban landscape, juxtaposed with the aesthetics an identity of female childhood scrapbook culture. Barnette documents the uncommon interaction of these two different identities. Works that standout—the pink princess decorated-toy ATV in front of the graffiti covered and slatted chain link fence, the chain link fence pattern in front of pink material, whose tones may suggest some sort of greenery is near. Lastly prominent in her practice is her connection with The Black Panther Party in various forms, most notably the symbol of the wicker chair (made famous by Black Panther propaganda posters of Huey Newton). The miniature wicker chair she uses in this exhibition uses a chain link pattern, and the chair is accompanied by a bag of Hello Kitty cotton candy. This show at Fisher Parrish is a two-person abstract narrative show cartoon illustrations in conversation with abstracted sculptures, with reference to home furniture. Upon entering the space, the viewer is greeted by two paintings by Aaron Jupin that use fencing to create spatial depth in the compositions, as well as play with the graphic history of the medium of illustration. Barriers are prevalent in all environments, but it is clear that today’s visual makers are especially conscientious of this prevalence. The relationship of high/low is not a new concept, but it seems that this generation’s visual makers are more conscious of the barriers that divide them, and their practice and content proves this. Los Angeles based visual artist that investigates social constructs through objects and painting mediums. Cages & Cubes: Art Experience or Craft Experience?